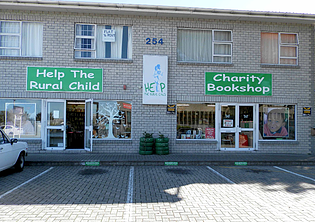 Help the Rural Child is a chain of charity shops that support the Goedgedacht Path out of Poverty Rural Youth Centres. Few people give much thought to rural children. They are usually hidden from sight, yet they are out there struggling each day to go to school often without food and proper clothing. It is a tough life for them. Help the Rural Child, through its charity shops, is doing its bit to help these children break out of the endless cycles of poverty that have trapped their parents for so many generations. Help the Rural Child has nine shops at present: two bookshops, one in Mowbray and one in Kirstenhof; four clothing and bric a brac shops in Mowbray, Retreat, Sea Point and Cape Town CBD; a furniture shops in Retreat and a Mobile Bookshop that goes out to schools. Our newest edition, connected to the Mobile Bookshop, is The Children’s Bookshop in Mowbray. Our shops are all run with two staff members and a wonderful group of volunteers. All the stock of books, bric-a-brac, clothing, furniture and household goods are donated by the very supportive Cape Town public. ​We hope that through our shops, so generously stocked with your donations, we will be able to give our rural children a chance to dream of a life without hunger, where they can be happy, receive an education and eventually make a positive contribution to the community and to the country.